Approximately 50 people convened at Monday night’s Boston City Council hearing, where they participated in a panel discussion and provided testimonies pertaining to plans for recreational marijuana legalization, as proposed on Massachusetts Ballot Question 4. The council, which met at City Hall, heard insights and concerns on strategies to ensure equality, especially by minimizing racial inequality, in marijuana licensing. 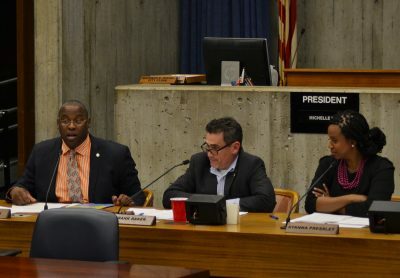 The meeting was facilitated by Boston city councilors-at-large Ayanna Pressley and Michael Flaherty, Councilor Frank Baker and Councilor Tito Jackson. Rahsaan Hall, the director of the racial justice program of the American Civil Liberties Union of Massachusetts, was one of the speakers at the hearing. Marijuana use across races, he said, is relatively similar, with 14.4 percent of white people and 16.6 percent of black people using marijuana every year. According to Hall, the level of involvement in marijuana dispensaries is different among various demographics. Hall said none of the eight medical marijuana dispensaries currently operating in Massachusetts are owned by people of color. Adler Larson, the vice president of Bay State Holistic, a medical marijuana dispensary in Boston, said one of the factors behind the racial disparity in the cannabis industry is the prohibitive costs involved in opening a dispensary. The application fee to open a dispensary, according to Larson, is $30,000, in addition to legal fees that can exceed $100,000. Furthermore, applicants are required to have $300,000 of liquidity to be considered to open a dispensary in Massachusetts, Larson said. Kiara Mark, a Roxbury resident, spoke at the hearing and questioned if people affected by the ballot question decision will see the results from the increased revenue. “We need to be very wary of the opportunities actually available to people of color, not just on what’s on paper, but if Question 4 passed, what is actively accessible and available to people of color,” Mark said. Attendees said they came to the hearing to express their concerns on racial inequalities, and wanted to learn how the legalization of recreational marijuana in Massachusetts may heighten these inequalities. Patrick Keaney, 47, of Brighton, said he attended the hearing to try to interpret what might happen after the Question 4 voting. Kristine Acevedo, 45, of Worcester, said she would like to understand more about the effects of recreational marijuana legalization.